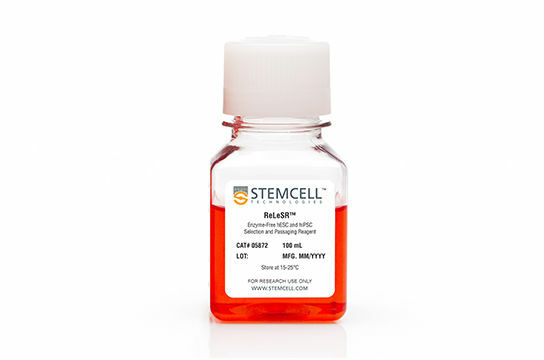 ReLeSR™ is a chemically defined, enzyme-free, animal component-free (ACF) reagent for dissociation and passaging of hPSCs without manual selection or scraping. Upon removal of culture medium and addition of ReLeSR™ to adherent hPSCs, undifferentiated cells are selectively detached, leaving differentiated areas behind. Passaging hPSCs with ReLeSR™ easily generates optimally-sized aggregates, while eliminating the hassle and variability associated with manual manipulation. 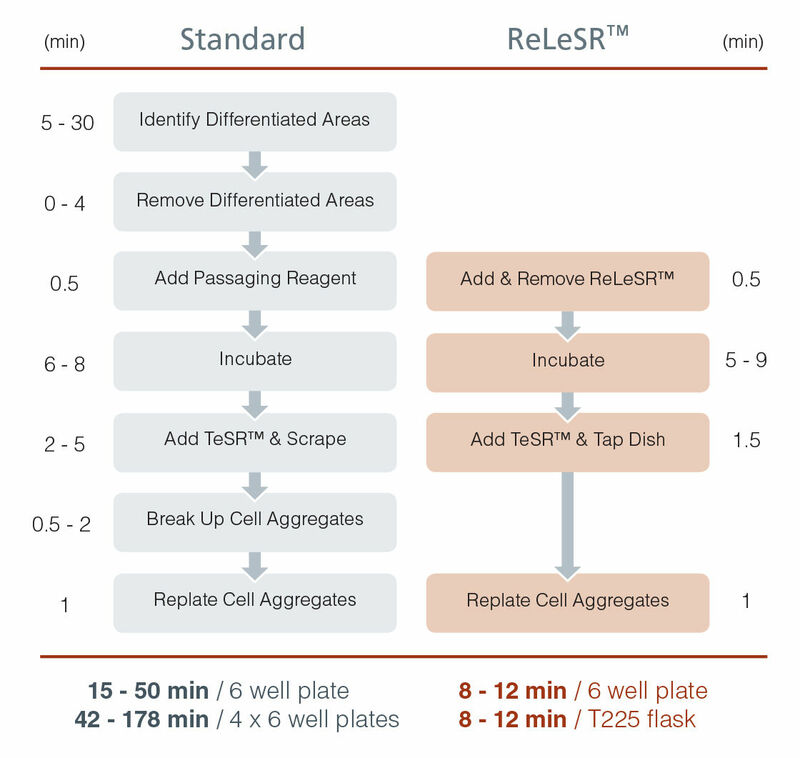 By selectively dissociating undifferentiated cells and eliminating the need for scraping, ReLeSR™ can be used with closed vessels and many other applications. To learn more about these applications, view the data. EASY-TO-USE. Selectively detaches undifferentiated cells, generating optimally sized aggregates without manual scraping. CHEMICALLY DEFINED. Enzyme-free formulation minimizes variability. SCALABLE. Fast protocol is compatible with culture processes involving closed vessels. COMPATIBLE. 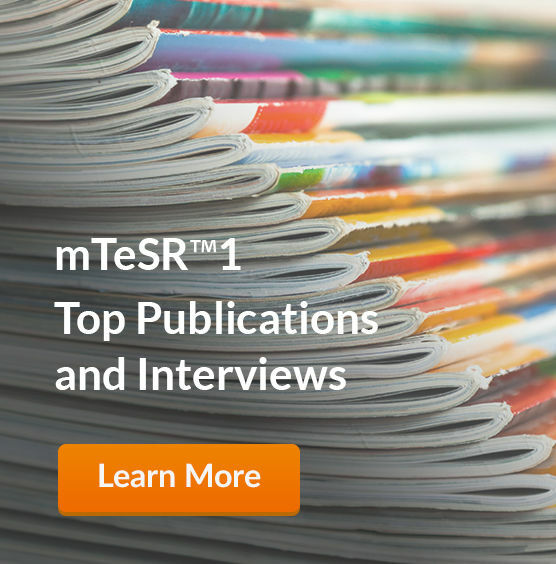 Works with mTeSR™1 and TeSR™-E8™. ReLeSR™ passaging protocol eliminates difficult and time-consuming steps, thereby enabling easy culture scale-up. Surface area of 4 x 6 plates (230 cm2) is comparable to that of a T225 flask (225 cm2). TeSR™ = TeSR™ family media (mTeSR™1, TeSR™2, TeSR™-E8™). Mitalipova et al. Preserving the genetic integrity of human embryonic stem cells. Nat. Biotechnol. 23(1) 19-20, 2005.